In a red-brick building on the Southernmost part of Northwestern University’s campus, Michael Szczepanek and his financial team are translating numbers into the stories empowering one of the most prestigious research institutions in the United States. The university was founded in Evanston, Illinois in 1851, and since then has grown to cultivate a global impact—made possible in part by the way the finance team takes the long view on protecting and furthering the prestigious institution’s legacy. According to the 2017 financial report, the private university’s total assets grew to $14.5 billion—an $836 million increase from the previous year. And with a AAA credit rating, Northwestern is able to advance its plans with vigor—even when knowing that the returns might not be seen for quite some time. In addition to strategic oversight, the Board of Trustees also provides a crucial lifeline, as significant contributors to what has become one of the largest endowments in the United States. Northwestern continues to grow its research portfolio, reporting approximately $650 million in sponsored research awards received annually, and is known for its top-ranked Kellogg School of Management, Pritzker School of Law, Feinberg School of Medicine, Bienen School of Music, and Medill School of Journalism. It’s this prominence that Szczepanek keeps top-of-mind in motivating his team to find financial solutions that can help further Northwestern’s reputation and goals, one of which is to reach as many students as possible regardless of ability to pay tuition. Alumni and friends of these renowned programs play a central role in the university’s progress. Recently, the giving program “We Will. The Campaign for Northwestern” surpassed $3.5 billion in new gifts and commitments. That vote of confidence from the Northwestern community attests to the mission of academic excellence and discovery. For Szczepanek, the mission-driven organization motivates his team to dig into the extensive data needed to help leadership set an industrious financial strategy. Historically, the team looked at financial results on an annual basis, but Szczepanek recently implemented quarterly and monthly tracking that helps them build a more comprehensive story. Last year, investments also enabled extensive renovations to the Welsh-Ryan Arena and, on the Chicago campus, the university built the Louis A. Simpson and Kimberly K. Querrey Biomedical Research Center. Developing its assets ensures the university’s legacy not only endures, but also expands. Outside the Midwest, its impact reaches to the campus in Doha, Qatar, and academic branches in Miami, Washington, DC, and San Francisco. In fact, Szczepanek says finance departments everywhere contain crucial stories ready for leadership teams to leverage. However, for these stories to be read and put into action, finance executives must not only translate the numbers, but also, as narrators, understand audiences. “We can have all sorts of charts that tell a wonderful story, but if we don’t simplify it for leadership or for our Board of Trustees in a way that helps them understand what’s important, it’s meaningless,” Szczepanek explains. To help write Northwestern’s legacy, Szczepanek cites his own family history. His maternal grandfather was also an accountant for a railroad pension fund. His fundamental advice? “Be honest and make sure it balances,” Szczepanek recalls. The finance leader also points to one of his first jobs as teenager in the fast-food industry, where he received an essential lesson in customer service. Szczepanek’s team recently combined Student Accounts and Student Loans into a one-stop-shop now known as Student Finance. The integrated approach provides students with direct access to their information, reflecting the changing dynamic of a student population that prefers real-time access on mobile platforms. He developed his own technical aptitude by earning a bachelor’s and master’s degree in accounting from the University of Illinois at Urbana-Champaign. After graduation, he spent the first five years of his career as a senior associate auditor at one of the Big Four auditors, PricewaterhouseCoopers. Then he joined another multinational giant, Pepsico, and later arrived at the University of Chicago in 2009. Within six years, Szczepanek’s role at the University of Chicago evolved as manager, senior manager, director, executive director, and treasurer. The series of promotions widened his purview from financial reporting to internal auditing, debt and capital asset accounting, and capital investment. There, the financial leader earned a second graduate degree: an MBA at the Booth School of Business. 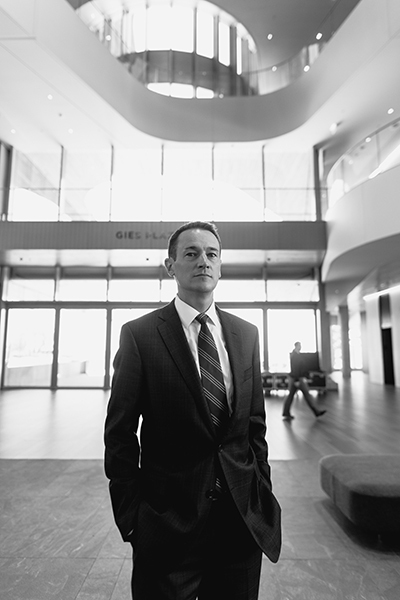 As Northwestern’s associate vice president of finance since 2015, Szczepanek and his team continue to embark on strategic endeavors that are helping write the most compelling chapters of the university to date.